Mercyhurst College was founded by the Sisters of Mercy of the Erie Catholic Diocese in 1926. In only the past two decades, the school has become one of the top comprehensive colleges in the North and the second largest Mercy college in America. And in the last eight months alone, many of you may have noticed the school has also undergone some great changes. Mercyhurst College was founded by the Sisters of Mercy of the Erie Catholic Diocese in 1926. In only the past two decades, the school has become one of the top comprehensive colleges in the North and the second largest Mercy college in America. And in the last eight months alone, many of you may have noticed the school has also undergone some great changes. In what is perceived as possibly the biggest change impacting the institution since going co-ed in 1969, the school received word this past January that the Pennsylvania Department of Education approved its application for university status, and as a result the College became Mercyhurst University. But that wasn't the only change sweeping across campus. Prior to this milestone, key individuals on campus were working on developing an umbrella organization known as the Mercyhurst Institute for Arts and Culture (MIAC) that would soon oversee the Mary D'Angelo Performing Arts Center. With this direction, a bachelor's degree would be added into the program, but because of the course direction, the director at the time, Michael Fuhrman opted to end his tenure and pursue another career. And after a nationwide search for a new director—one to oversee the Institute—Jamie Grady was hired and brought to Erie. Because of this, some members of the community started to wonder the direction of the Mary D'Angelo Performing Arts Center. We've all heard the saying, "you don't need to re-invent the wheel." But the truth is, all organizations at some point need to do just that. Alongside education, the arts are a fickle and constantly changing landscape. Ticket sales rise and fall, and wants and needs of supporters constantly evolve as tastes change. Because of these, and other variables, organizations need to keep up with the trends and grow alongside them. They need to remain competitive in what has always been a delicate environment – and to constantly challenge the status quo. So, what was their reasoning? But, before we go there, let's backtrack for a moment. About 18 years ago, I was a freshman undergraduate student at the D'Angelo School of Music at then Mercyhurst College. It was 1994 and the Mary D'Angelo Performing Arts Center was not even in existence yet. At that time, it was the Zurn Recital Hall, and it paled in comparison to what Erie has come to know as the Performing Arts Center. My best memory of the hall itself is mostly faded, but just to give a perspective, I do recall the tired yellow upholstered seats that lined the hall (and even that could have just been the lighting). The space offered such limited opportunity for large-scale performances that one of my favorite operas that I sang for in the choir—"Cavalleria Rusticana"—had to be staged at Mercyhurst Preparatory High School. I recall this moment because I'm particularly drawn to this work. Why you ask? Well, because it is the opera that can be seen at end of "Godfather III" – my second favorite Godfather. And please understand, I do realize upon writing that last statement that I should never be asked to do a film review. So, given what was already before me that year, one can imagine the excitement of learning that in less than two years, the college would be home to a state-of-the-art, 824-seat performing arts center. The $3.7 million facility would eventually bring world-renowned artists through its doors and the space was limitless for future performances with a 3,400 square-foot stage. The hall would now instead be adorned with red carpet and matching plush seats; a number of private box seats; and the exact same Austrian crystal chandeliers that hang in the Metropolitan Opera in New York. It would also become the first theater in the U.S. to use geothermal energy to heat and cool its facility. It would be the largest and most stunning of performance spaces on campus. And it would be designed to be a bold statement for the future of the arts in Erie. But I would soon come to realize, although I would have close to two years left in the program, there wasn't ample opportunity to have a hands on approach with this new beautifully crafted center. Although Fuhrman would honor as many of the requests as he could from each of us personally (recitals and such), its original intent didn't include much student involvement – to the degree that it's about to. In its infancy, the center brought in nearly 4,000 people per year and offered between six and seven classically rooted programs– featuring renowned artists such as singer Kathleen Battle and the Juilliard String Quartet. Over the years, those at the helm continued to broaden the programming's horizon and soon those steering the Center began offering more contemporary counterparts to the classical base they had built. Today, the facility brings in over 27,000 ticket holders and boasts around 10 major performing artists programs; 13 HD Live Metropolitan Operas; and six films annually with their On Screen/In Person film series. Since the beginning, the leadership and programming has continued to grow exponentially to bring the school to where it is today, in this case, with the newly developed Mercyhurst Institute for Arts and Culture (MIAC). Actually, though, the Institute concept isn't new to Mercyhurst. In fact, there are several of them on campus that are known well throughout the community - including the Mercyhurst University Institute for Intelligence Studies and the Mercyhurst Archaeological Institute - just to name a few. The intention of the Institute isn't to rework the mission – instead to expand upon it. Therefore, the Institute is still going to continue to offer the community the same great arts programming already established by the Mary D'Angelo Performing Arts Center but it will now integrate a new academic component – a bachelor's degree in arts management – and offer the student body a more hands-on experience. And this is where the changing of the guard comes in. 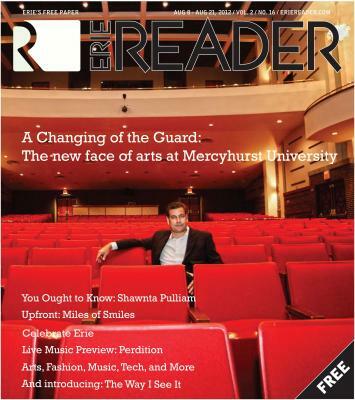 Jamie Grady is the new director for the Mercyhurst Institute for Arts and Culture. A native of Holyoke, Mass., Grady has already experienced a 25-year career in the arts that spans the U.S. and includes many successful leadership roles in symphony orchestras, theaters, and academic institutions. Prior to his appointment, his experience led him to be the fundraising manager of the New Zealand Symphony Orchestra. This was his first professional career abroad. "I was living in Pittsburgh in 2010. Although I was a professor in a great arts management program at Point Park University, I felt something was lacking in my career and started to search for something abroad," Grady says. "The opportunity in New Zealand opened up so I took it and pretty much packed up and left." Although he would spend less than two years overseas, his short time there proved to be abundant in experiences. "I worked with the Green Party in New Zealand as well as being a licensing administrator for the real estate agents authority, and then as the fundraising manager of the symphony," he explained. "I came back to visit in August of 2011, and it was at that point I realized I not only wanted to move back home, but I also really wanted to get back into an academic environment. It was then that I learned about this position." This position would be the new director of the MIAC. In this role, Grady would be charged with developing, planning, and executing all of the artistic and cultural events on campus in coordination with selected faculty and students (much like his predecessor) but would also develop, oversee, and integrate a new academic program that is consistent with the operation of other institutes on campus – ones that have already seen great success. In short, the MIAC would become the umbrella organization for all programming accomplished by the Mary D'Angelo Performing Arts Center. So never fear folks - the Performing Arts Center will still be an integral part of the Institute. It's just now part of something bigger and better. And because of this, Grady has great plans in store for the future – keeping with the programming that has always been offered, but building upon the resources already there – and engaging the students to a much greater degree. And what could be wrong with that? "There is no strong performance without a little fanaticism in the performer." As was just stated, subscribers to the programs will continue to see the same great programming currently in existence. One of the objectives the individuals involved all agree upon is the Institute wants to engage and broaden the audience to a greater degree than they have seen in the past – and to see more of the students, the young, and the young at heart. To the community, the only real visual change will be in the actual presentation of the series. 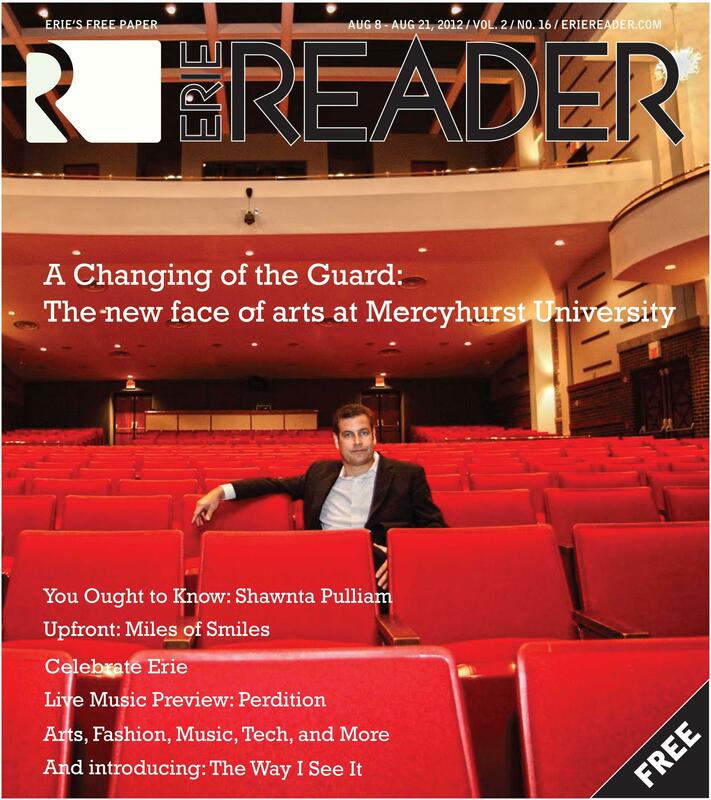 While before it was just the PAC, now it will be the Mercyhurst Institute for Arts and Culture presents…the Mary D'Angelo Performing Arts Center; or the On Screen/In Person Film Series; or the HD Live Metropolitan Opera Series. "My predecessor Michael Fuhrman had already set the programming for this upcoming season before I started," explains Jamie. "The lineup is quite spectacular and we do have some great artists coming in." I ask him what some of his favorites are, and although he pretty much ran through the entire list (I had to ask him to stop), he did touch upon a few that he was really looking forward to. "In September, the Voxare String Quartet will perform in front of a silent film, Man With a Movie Camera. It's unique because it brings two art forms together simultaneously. It's a 1929 Russian film that presents urban life in various Soviet cities, showcasing Soviet citizens at work and at play. It really set the standard for other film techniques." What he means by this is that the film is famous for the range of cinematic techniques, such as double exposure, fast motion, slow motion, freeze frames, jump cuts, split screens, Dutch angles, and so on. "It's really quite unique, and afterward, we'll have a post film discussion too." The Institute will also celebrate the 200th anniversary of Jane Austen's classic romantic comedy, "Pride and Prejudice." "L.A. Theatre Works [a media arts organization whose mission is to present, preserve, and disseminate classic and contemporary plays] will put on a staged radio play, and the company has gotten rave reviews. It's a really exciting and fun piece, and I am really looking forward to it." In addition, some other favorites I noticed were: world-renowned jazz guitarist and composer Pat Methany; jazz trio Ninety Miles; and performing artists The 5 Browns. Ninety Miles consists of critically acclaimed jazz musicians vibraphonist Stefon Harris, saxophonist David Sánchez, and trumpeter Christian Scott. Their album (which carries the same title as the band's name) was recorded over the span of a week in Havana, Cuba. The trio recruited local Cuban musicians to create the nine-song collection. The result is a true Cuban American musical collaboration that defies political borders – and ultimately became a documentary. The 5 Browns are five classically trained pianists (all were accepted to Juilliard simultaneously) that perform complex piano works individually or collectively. They've been critically acclaimed in People magazine, seen on Oprah and 60 Minutes, and also have three albums that reached the No. 1 spot on Billboard Magazine's Classical album chart. In addition to the Performing Arts Series, there will also be the continuation of the On Screen/In Person Film Series. Launched back in 2011, the series brings independent American films and filmmakers to communities across the region. Although they currently don't have a named major sponsor (it used to be the Guelcher Film Series), they're keeping with tradition with a great lineup to entertain even the most discriminating film aficionado. Mary Ellen Dahlkemper, Chief Operations Officer at Stairways Behavior Health, has been a long-time proponent and supporter of the performing arts center from its inception. "People come from all around the region and across the borders to attend and see world class performances," she says. "That's the thing that grabs us – that they're world class performers. It affords us an international experience we may not get elsewhere. We see and hear about different cultures and different modalities of art – dance, music, the movie series and the Met Opera – it's really robust. Between the performances and the film series, it all keeps us in tune with what's going on around the world, from the talent and culture to the current events." The Metropolitan Opera series is what's close to her heart though. "My husband and I are long time fans. And what's so beautiful about the series is that it's in real time. We are watching these performances with millions of people around the world that love opera," she explains. "It's the best of music and performance and staging. And comically, it costs less to see it here than it would be to even park at Lincoln Center in New York City!" I learn the cost is around $20 for a ticket to see the performance here and that it costs upwards of $35 to park at Lincoln Center (and it's free parking here). "And to see it in an actual theater – not a movie theater – is unbelievable." And the view is equally amazing. "There's seven cameras positioned within the Met. When you go and see a performance live, you have one view. But on the big screen, you have seven different views. You get to be up close and personal. From the details of the costuming and the makeup from the varying angles you get to see different perspectives, it's a truly awesome experience for anyone that loves theatre. I don't know of any other venue that is as incredible as the PAC." The hall offers the highest quality sound system, but not just for the opera. "We knew right off the bat we were going to enjoy going to any performance. The sound is fabulous. And we even hear this from the performers. Some have told us its one of the greatest places they enjoy performing at. Their voices and music projects perfectly in that auditorium. And that was planned very carefully by the architects." As for that new degree program? Students will now have one more option when attending Mercyhurst: To pursue a bachelor's degree in arts management. David Livingston is the associate vice president of Advancement at Mercyhurst University. He's been part of the PAC since its inception (and every time I hear his name I recall the words allegedly spoken by the British-born explorer Henry Stanley in 1871, "Dr. Livingstone, I presume?") just for added (read: fun) measure. According to Livingston, "Over the last three years, we really started to reflect upon the future and growth of the PAC. One of the most pertinent and immediate goals we realized is that we wanted to increase the hands-on experience for students. In every other degree, students are graduating with experience in a lab, working at an internship, or doing other practical things that they can apply to their professions after they graduate." It was during this time they considered developing the bachelor's degree. "More often than not you see arts management in master's degree programs. But we knew if we could develop this undergraduate degree and give students the hands-on necessary experience - students could be backstage being part of the event or front stage experiencing the event. We realized it was an immensely valuable component to the education that we were lacking." So, that's what the University did. According to the mission, the degree will provide students with the knowledge and skills necessary to be successful producers of art experiences, through an intensive combination of learning methods with a focus on developing patrons for the arts. Graduates of this program will be exposed to a variety of employment opportunities, including presenting and producing arts organizations, and museum and gallery management. Additional employment opportunities include film, television, radio, emerging media, and other creative industries. "Oftentimes the student that's been involved in the arts – whether it's theater, music, dance, etc… comes to the realization that they don't want to pursue a degree in the actual art form, but then don't know where to go," Grady adds. "That's the most difficult part about this program. Many people don't know how to look for it. They know what they don't want, but they don't know where to go and they don't realize the opportunities outside of being a performing artist. We hope to be able to spread the word about this." As he tells me this, I silently agree and think about how great it would have been if such a program had existed when I was in school. I knew two years into my degree (I was a piano performance major), that I didn't want to lead the life of a professional musician. Not that I didn't love performing, as I did – but I no longer wanted to spend countless hours in a practice room, and I knew I ultimately wouldn't give it the same time and dedication that others in their respective fields were – and should. At the same time, I loved the arts and I wanted to somehow stay in the field. But I just didn't know how. Come this fall, students experiencing the same thoughts I was having will have the chance to pursue this degree. According to Grady, "The University initially wanted me to put the program on the books in the fall of 2013. But I didn't want to sit around an entire year without a program. So we worked endlessly to get it started. Right now we're targeting incoming freshman that may be undecided." I ask him how many students. He smiles. "We have one full-time student. But you have to start somewhere!" Although I do learn that in a few of his classes he has far more than one student. And all have varying instruction. It's designed with one arts management related course per semester and the rest are a business and liberal arts core. "We really want the students to start attending the shows," Livingston adds. "The goal of the core curriculum in general is to expose students to the liberal arts more broadly. The experience of students observing an opera, watching professional dancers, listening to cellist, etc.… engaging them more. Our primary purpose is education of course, and we wanted to develop a way to utilize this beautiful asset for not only the community – but for our main objective – the students. We weren't seeing enough of them in the seats. While we want to hold on to the community audience, we have the capacity to include the students and we haven't been taking advantage of that. We realized it was time to change." To all those involved, one of the most vital components is to create future patrons of the arts. "That's what we're here for. We need to expose students to the varying art forms and world class programming that they weren't getting before. Simultaneously we will continue to engage the community. I mean, we have an Institute of Archaeology and forensics and oftentimes when a body is found and they don't have the expertise available, the students will go out with the faculty and do the forensics on it. We are still trying to help the community in different areas and this is our cultural component." I ask Grady what he hopes to accomplish during his tenure. "I'm trying to make change – and not in big capital letters. I want to see what fits everyone's interests – the students and the community combined. I want to look at what's out there. I want to work with other area organizations – not only supporting them but bringing them in to be part of what we're doing. I would love to see an active mix of the older and younger groups. I know they can engage each other and share stories. The older audience members are the most adventurous around here because they've had the most experiences. If you begin introducing these performances to the younger individuals, the more likely they'll continue to go in the future and become supporters and advocates themselves – plus we need to continue to offer better product to the students – because, isn't that what we're here for anyhow?" We all heard the rumblings in the community. The concerns with the future of the D'Angelo Performing Arts Center. But you can see the only change is growth. And we understand with all change comes adversity. People worry that because you're doing something different than you were before that the original project couldn't have been a success. Quite the opposite is true in fact. As many organizations become ever more stagnant, it is those that continue to evolve and change over time that will continue to build upon their success. And that is the constant plan for both the Institute of Arts and Culture - and all the organizations that fall under its umbrella and, of course, the University overall.